O God, who raised up Saint Mark, your Evangelist, and endowed him with the grace to preach the Gospel, grant, we pray, that we may so profit from his teaching as to follow faithfully in the footsteps of Christ. Who lives and reigns with you in the unity of the Holy Spirit, one God, for ever and ever. St. Mark, the author of the second Gospel, was the son of Mary whose house at Jerusalem was the meeting place of Christians. He was baptized and instructed by St. Peter. In about the year 42 A.D. he came to Rome with the Prince of the Apostles. There at the request of the faithful he wrote his Gospel about the year 50 A.D. His Gospel is a record of St. Peter's preaching about Our Lord and pays special attention to the head of the Apostles. The Gospel was written for Roman Gentile converts. It rarely quotes the Old Testament, and is careful to explain Jewish customs, rites and words. It excels in portraying the emotions and affections of both Christ and His hearers. St. Mark preached in Egypt, especially in Alexandria and was martyred there by the heathen. According to the 1962 Missal of St. John XXIII the Extraordinary Form of the Roman Rite, today is the Feast of St. Mark, and the Major Rogation. While no longer required after Vatican II, Rogation Days can still be observed by the faithful. Fasting and penance were required, and the faithful would especially pray Litanies on this day. "Rogation Days are the four days set apart to bless the fields, and invoke God's mercy on all of creation. The 4 days are April 25, which is called the Major Rogation (and is only coincidentally the same day as the Feast of St. Mark); and the three days preceding Ascension Thursday, which are called the Minor Rogations. Traditionally, on these days, the congregation marches the boundaries of the parish, blessing every tree and stone, while chanting or reciting a Litany of Mercy, usually a Litany of the Saints". John Mark, later known simply as Mark, was a Jew by birth. He was the son of that Mary who was proprietress of the Cenacle or "upper room" which served as the meeting place for the first Christians in Jerusalem (Acts 12:12). He was still a youth at the time of the Savior's death. In his description of the young man who was present when Jesus was seized and who fled from the rabble leaving behind his "linen cloth," the second Evangelist might possibly have stamped the mark of his own identity. During the years that followed, the rapidly maturing youth witnessed the growth of the infant Church in his mother's Upper Room and became acquainted with its traditions. This knowledge he put to excellent use when compiling his Gospel. Later, we find Mark acting as a companion to his cousin Barnabas and Saul on their return journey to Antioch and on their first missionary journey. But Mark was too immature for the hardships of this type of work and therefore left them at Perge in Pamphylia to return home. As the two apostles were preparing for their second missionary journey, Barnabas wanted to take his cousin with him. Paul, however, objected. Thereupon the two cousins undertook a missionary journey to Cyprus. Time healed the strained relations between Paul and Mark, and during the former's first Roman captivity (61-63), Mark rendered Paul valuable service (Col. 4:10; Philem. 24), and the Apostle learned to appreciate him. When in chains the second time Paul requested Mark's presence (2 Tim. 4:11). An intimate friendship existed between Mark and Peter; he played the role of Peter's companion, disciple, and interpreter. According to the common patristic opinion, Mark was present at Peter's preaching in Rome and wrote his Gospel under the influence of the prince of the apostles. This explains why incidents which involve Peter are described with telling detail (e.g., the great day at Capharnaum, 1:14f)). Little is known of Mark's later life. It is certain that he died a martyr's death as bishop of Alexandria in Egypt. His relics were transferred from Alexandria to Venice, where a worthy tomb was erected in St. Mark's Cathedral. The Gospel of St. Mark, the shortest of the four, is, above all, a Roman Gospel. It originated in Rome and is addressed to Roman, or shall we say, to Western Christianity. Another high merit is its chronological presentation of the life of Christ. For we should be deeply interested in the historical sequence of the events in our blessed Savior's life. Furthermore, Mark was a skilled painter of word pictures. With one stroke he frequently enhances a familiar scene, shedding upon it new light. His Gospel is the "Gospel of Peter," for he wrote it under the direction and with the aid of the prince of the apostles. "The Evangelist Mark is represented as a lion because he begins his Gospel in the wilderness, `The voice of one crying in the desert: Make ready the way of the Lord,' or because he presents the Lord as the unconquered King." Patron: Against impenitence; attorneys; barristers; captives; Egypt; glaziers; imprisoned people; insect bites; lions; notaries; prisoners; scrofulous diseases; stained glass workers; struma; Diocese of Venice, Florida; Venice, Italy. Symbols: Winged lion; fig tree; pen; book and scroll; club; barren fig tree; scroll with words Pax Tibi; winged and nimbed lion; lion. Often Pictured as: Man writing or holding his gospel; man with a halter around his neck; lion in the desert; man with a book or scroll accompanied by a winged lion; holding a palm and book; holding a book with pax tibi Marce written on it; bishop on a throne decorated with lions; helping Venetian sailors; rescuing Christian slaves from Saracens. 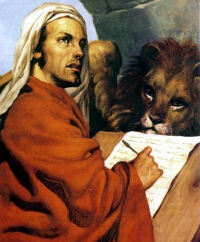 Read further about St. Mark in the Catholic Encyclopedia. This day is honored in the Liturgy by what is called Saint Mark’s Procession. The term, however, is not a correct one, inasmuch as a procession was a privilege peculiar to April 25 previously to the institution of our Evangelist’s feast, which even so late as the sixth century had no fixed day in the Roman Church. The real name of this procession is The Greater Litanies. The word Litany means Supplication, and is applied to the religious rite of singing certain chants whilst proceeding from place to place in order to propitiate heaven. The two Greek words Kyrie eleison (Lord, have mercy on us) were also called Litany, as likewise were the invocations which were afterwards added to that cry for mercy, and which now form a liturgical prayer used by the Church on certain solemn occasions. Excerpted from The Liturgical Year by Dom Guéranger, O.S.B. Read about rogation days at St. John Cantius Parish.